Today on Vikings Corner we will re-analyze the questions we formulated after Minicamps and OTA’s. There are many questions that haven't been answered, but let's answer our "Post-Training Camp Questions and Storylines." 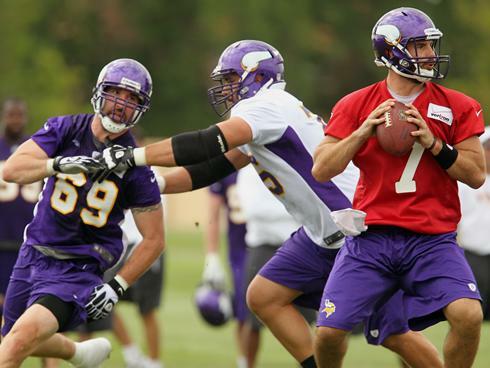 Christian Ponder has been very poised in his performances at Vikings Training Camp. He bulked up in the offseason to better withstand the hits he takes on a daily basis. With that addition to his physique, he has stayed in the pocket and has improved his arm strength. Ponder does need to develop better accuracy on his passes. He was struggling to be a 60% passer during practice, but eventually improved during the duration of training camp. In addition, he struggles at times with control of his passes and tends to let the ball get away from him. Overall, these problems aren’t seen on a consistent basis, so they are marginal issues that can be fixed with work. Running Backs: How will Adrian Peterson respond to his torn ACL? Will he ever be the same? Can Toby Gerhart fill his shoes until he returns? Adrian Peterson returned from the ACL, MCL, and meniscus tears 222 days after the injury occurred in Washington. He responded by working to prove the world that he would be ready for the season. Now the next phase in the process will be live contact drills, which will occur in the coming weeks. Peterson will be the same athlete and possibly better than before the injury. He physically seems stronger and faster than before the injury, but the key factor is how his knee will hold up for the duration of the season. Toby Gerhart looked impressive in his first appearance of the season, rushing for 31 yards in the first game. He was running through defenders and had a nice scamper on third and six for 17 yards. Gerhart will be an excellent backup to Peterson and is a nice “one-two” punch with Peterson. Gerhart’s “pile-driving” ability with Peterson’s speed, should be fun to watch during the season. Jerome Felton went under the radar during camp and wasn’t talked about as much as anticipated. Felton brings an average ability to run block, but doesn’t have the ability in the passing game. D’Imperio has been a major improvement in run blocking over last season and can be affective in the passing game. D’Imperio will make this roster because he has flexibility to play special teams, where Felton isn’t as flexible in that aspect. This is an ongoing battle that will take place during the duration of the preseason. Jerome Simpson will be the vertical threat for the Vikings, after he returns from his three game suspension. In the meantime, many are questioning who will step up in his absence after the season ending injury to Greg Childs. Players like Michael Jenkins, Devin Aromashodu, Manny Arceneaux, and Stephen Burton will all contend for the last two or three split end slots. If roster cuts were today, I believe Aromashodu, Jenkins, and Burton would most likely make the team, but wide receivers Coach George Stewart indicated that Manny Arceneaux has the ability to be a threat on the roster this season. This will be another battle that will be interesting to watch. Percy Harvin resolved the “issues,” that he states never really happened. I believe him and feel like he will be a pivotal piece to the puzzle if the Vikings are going to be successful. He is the target Christian Ponder relies on most and this will be important down the stretch of the season. No questions asked, Matt Kalil has lived up to the expectations and has exceeded some. During training camp, we saw his strength and his ability to run block. He was in better physical shape than I expected he would be. He is so soft on his feet and is one of the most agile offensive lineman in this league. His presence has already boosted the play of the offensive line immensely. Moving Charlie Johnson to left guard better suited his physique and adding Kalil next to Johnson has increased pass protection. Protection will continue to improve and the offensive line will be a strength of this team. Kyle Rudolph has been one of the most impressive players at Vikings training camp. He has nice hands for being such a big individual. He gives us a major threat in the redzone and is great across the middle. He will be one of the most improved players in the NFC North this season. John Carlson has been held out due to an MCL sprain he sustained towards the beginning of training camp. We weren’t able to analyze his performance in the short period of time he was active. Carlson has struggled with injuries in the past and it will be interesting to see if this continues to be a trend during his tenure with the Vikings. The Vikings defensive line has showed consistency in pass rushing, but struggled in run defense in the first preseason game. Going into the preseason game, I believed the defensive line would be one of the strengths of the team. But with Antoine Winfield, Jared Allen, and Kevin Williams all returning to the lineup, this will be improved. Jared Allen will have another great season and has a chance to match his sack total. He looks like he is in the same physical and mental condition and will continue pestering defense’s all over the league. This position is better than most Vikings fans had expected. Players like Tyrone McKenzie, Marvin Mitchell and Audie Cole have shown they can be a legitimate option at the linebacker position. With the additions of these players, to the current cast of starters, this position will be much improved over last season. Jasper Brinkley has not shown he is the best option at middle linebacker; as of yet. He looked very tentative in the first preseason game and he will need to show that he is the answer. Marvin Mitchell and Tyrone McKenzie are knocking at his heels and he will need to step up over the next couple games. Cornerbacks: Will having Chris Cook this season and adding Josh Robinson and Chris Carr help improve a terrible secondary? Chris Cook has looked very impressive at training camp and has the ability to be an elite cornerback in this league. His height advantage and sheer athleticism are all attributes that will improve our secondary. Josh Robinson missed time with a hamstring injury, but made his presence known when he returned, with two interceptions on the last two days of camp. He will be a huge impact on the roster during the long-haul of the season and will be a force for seasons to come. Chris Carr is merely a backup option, but could start in a fill-in situation. He is a great tackler and is average in coverage. Let’s face it, he is an older cornerback and doesn’t have the speed he used to have, but he is a better backup option than we’ve had in years past. Jamarca Sanford and Mistral Raymond both haven’t been bright spots in the Vikings secondary early in the 2012 campaign. Raymond and Sanford both are terrible in run support and aren’t starting caliber safeties. Robert Blanton was rumored to be in the hunt at safety, but he missed most of camp with a hamstring injury. He will be interesting to watch in his return over the next few preseason games. The Vikings are now adding Harrison Smith to the starting rotation and will most likely start him alongside Mistral Raymond for now. Smith will bring physicality to a secondary that needs players who can execute in situations. Chris Kluwe is great for the life of the Vikings locker room. Kluwe’s humor and joking presence helps keep the team positive in specific situations. In addition, Kluwe is one of the best punters in this league and is great at dropping the ball inside the twenty yard line. Blair Walsh has been an excellent addition to the roster this season. There is absolutely no question that Walsh will be a kicking option for seasons to come. He has a huge leg and will not only improve field goal length, but will be able to boom the ball out of the endzone on kickoffs. Blair Walsh will not be inconsistent and this will prove to be one of the best decisions the Vikings organization has made during the offseason. Overall, the Vikings have several questions that have been unanswered and we will take a look at those when the preseason is completed. Over the duration of Vikings training camp, the Vikings have made strides and will look to improve upon those over the coming weeks.